Mandatory Evacuation Zone is what we get when a writer decides that memoir, history, and politics can all be poetry. In this collection, Felice Aull writes of what might have been seen and heard - at a ballgame, in the sky, on a mountain trail, in a cancer clinic, on the sidewalks of Manhattan - and of what may have been felt and understood in such a complex multiplicity of "zones." Despite that required departure ("mandatory evacuation"), her personae long to linger - to see, hear and feel as much as they can. From the giddiness of childhood to the occasionally shocking dizziness of becoming an elder, the characters in these poems have intimate encounters and personal revelations that teach the unavoidable lesson: all of life is a "mandatory evacuation zone." This wide-ranging collection crosses through time and space, embracing five generations and moving fluidly from wilderness trails to city parks. 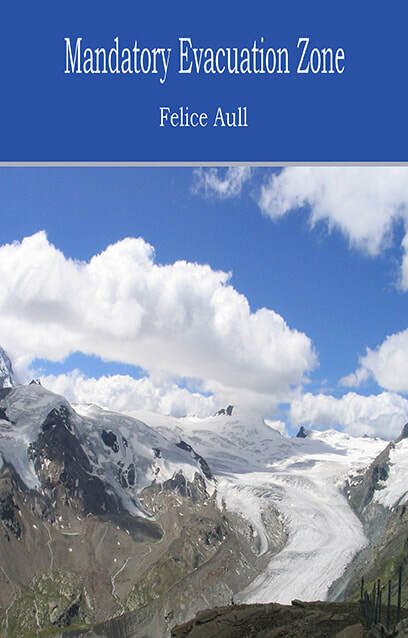 Wherever she finds herself (and transports her reader), whether an inn in the Alps or a turnpike restroom, Felice Aull is always attuned to the histories and traumas that haunt the present locale, rendering each “place of flux and loss” with careful observation and clear-eyed emotional candor. While reading Felice Aull’s second poetry collection Mandatory Evacuation Zone, the world around me disappeared. Her words transport me through the rich decades that are her life. Poem after poem, she guides the reader through lush trips around the world, and into her acute observations of people and places. Aull triumphs in remaining positive even in the face of grief. Her language is precise, and her pace steady and determined. I trust following her through history, countries, love, and heartbreak. Each poem is exquisitely wrought creating a symphony of authenticity. Aull has written a book that expresses not only the expansiveness of her life - a life lived with grace and vision - but a world we can all relate to because her words touch moments in all of our lives.